The early day homes and business stores that were clustered at Oneida St. and Broadway, across from the central police station, have been torn down and a large auto supply house is being built on the site, the site runs clear to the alley on Oneida and a quarter of a block on Broadway. These old buildings are shown in the accompanying illustration and particularly the odd little two-story brick house on the corner has occasioned much speculation as to its past history, some persons contending that it was at one time used by a city court. This is an error. The corner house was built by Williams Lee in 1844. 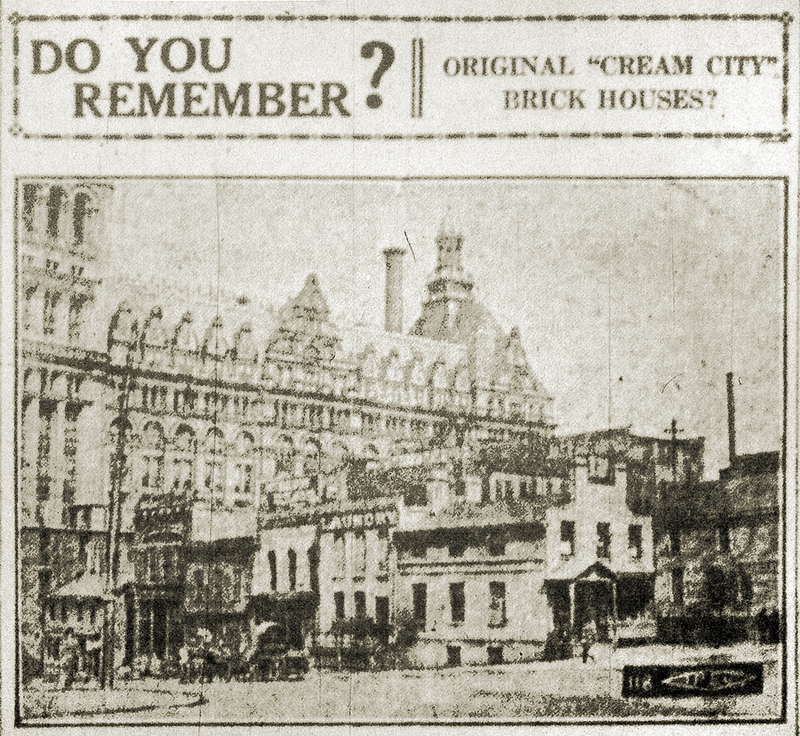 It was the sixth brick residence erected in Milwaukee. The bricks that were used were made at the intersection of Muskego Ave. and Madison St. and could truly be called original cream city brick. Lee lived in the residence for many years and raised a family there. Recently when the corner was excavated, two extensive brick-arched tunnels were found running under the Broadway sidewalk, large enough to suggest use by some early brewery. But they were not for such a purpose but the northerly one was made the opening of a great vein of spring water, that ran obliquely toward Oneida St. and thence across the present Pereles corner to the center of the city hall (Market) square, where for many years, in there earlier days, there was located the town pump. This pump supplied water for a great many residents even from the west side of the river. The other vault was for provisions. What do you imagine Lee paid for having the brick laid for his residence? He paid $3.75 a thousand, as is vouched for by his son, who is a prominent member of the Old Settlers’ club. In those days there was a heavy Irish immigration to Milwaukee and Lee Sr., employed a large gang of men with wheelbarrows to help grade down a ridge of land that skirted his property on the west is well as all along the adjoining district, and to fill up a deep and wide depression, called a kettle hole in those days. Later Lee sold parts of his holdings on Oneida St. to others, among them William Harper, the early day painter and wallpaper man. The Harper shop was there until recent years. After the Lee occupancy the corner house was used by various tenants and Robert Schilling lived there at one time. Latterly, as shown in the picture, the front was given a show window and a china decorator used it. Williams Lee was from Chester, Mass., and opened a saddlery store at 413 East Water St. Later he had his store at 85-87 Wisconsin St. Finally his business was removed to the United States hotel, East Water and Huron Sts. in the store next to the corner entrance on East Water St., and was notable for the figure of a horse on a pole in front of the store. He occupied his corner dwelling as late as 1881.